The GSA HSPD-12 MSO initially contracted with a single provider to deliver a government-wide shared service solution that facilitates PIV credential issuance and management. This approach offered a reasonable cost, speed to market, and met numerous mandates for security and privacy. As a result, over 1,200,000 individuals have been enrolled in the USAccess Program through FY2016. Minimize risk associated with transition of core service provider; ensure credentials work through any transition. Strengthen management and control of service delivery. Ensure financial viability of the USAccess Program. Maintain price point for customers. Maximize the competitive nature of service provision. Facilitate compliance with oversight requirements. 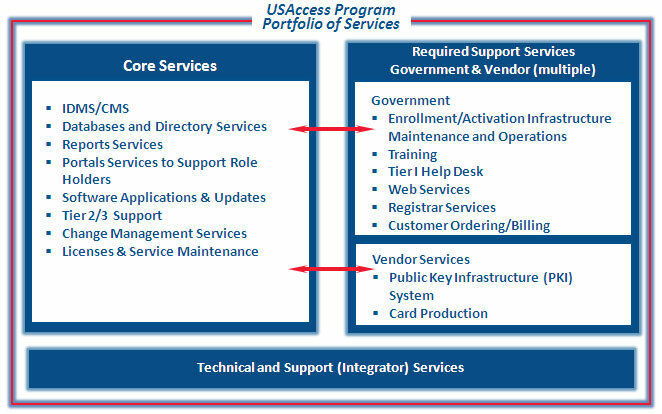 To achieve this, the HSPD-12 MSO analyzed the service components and divided them into Core and Non-Core services areas with Technical and Support services cutting across both areas as shown in Figure 1 - USAccess Program Portfolio of Services. One important conclusion from the analysis identified the necessity for continuing the current operation past the contract end, so a logical follow-on was awarded for the Core Services--the continuation of the USAccess shared service solution for PIV credential issuance and management system. This will allow the current contractor to operate and maintain the USAccess system. This contract provides a transition strategy to enable GSA to achieve a more flexible and competition-friendly HSPD-12 compliant service. It forms the basis for a longer-term sourcing strategy for providing the services via a fully competed contract or contracts. Also, it represents the highest likelihood of success with the lowest program risk. The functions listed in Figure 1 under Non-Core services and Integrator services have been identified as suitable for either competition or bringing in-house. The HSPD-12 MSO continues to refine its business and IT strategies that will pave the way for determining its future sourcing approaches. HSPD-12 Shared Service Provider III, awarded to HP Enterprise Services, LLC awarded July, 2011. Continue to watch FedBizOpps.gov for the latest on procurements related to the USAccess Program. For more information about the program's sourcing strategy, please refer to How to Contact Us.